The International Design Center NAGOYA houses a collection of American design products from the Art Deco period of the 1930s. In the history of 20th century design, such American design products had a major influence on Japanese industrial design. The collection includes over 2,000 pieces, including graphic art works, furniture, tableware, and a wide array of products that featured in all aspects of people’s lives. Our Collection Exhibition Series showcases works from the collection based on a theme selected for each show. 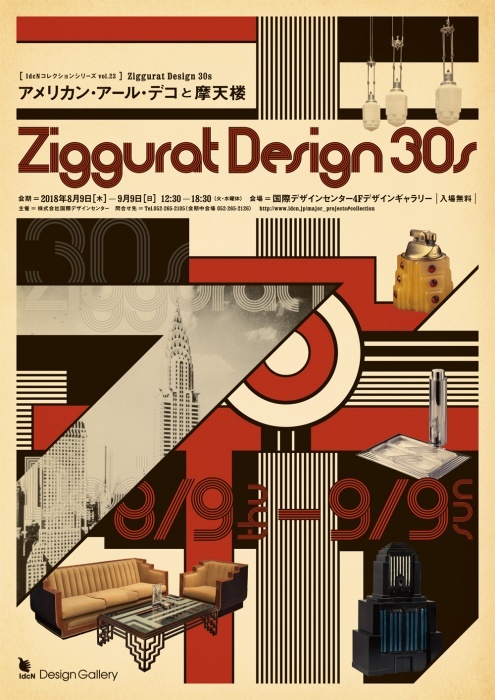 This time, its 23rd, “Ziggurat Design 30s American Art Deco and Skyscraper” is being held until September 9. Art Deco design had always been distinguished by its geometric expression. As skyscrapers started springing up one after another in the New York skyline, the simple yet powerful stepped “ziggurat pattern” formed by the towering buildings rejuvenated the art nouveau style, which had traditionally emphasized curved lines. This exhibition features furniture, lighting fixtures, and commercial products that incorporate the ziggurat pattern. This is a fine opportunity to experience the modern American lifestyle scene, a time of economic growth and new design styles representing what is sometimes called the Machine Age. Organizer: International Design Center NAGOYA Inc.